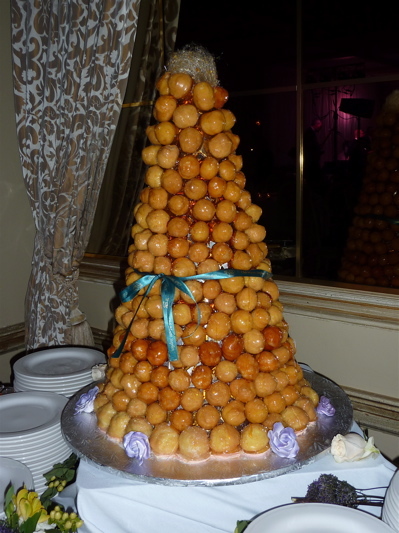 In addition to attending our friend’s wedding (croquembouche should be the de facto wedding cake for the whole world, no? 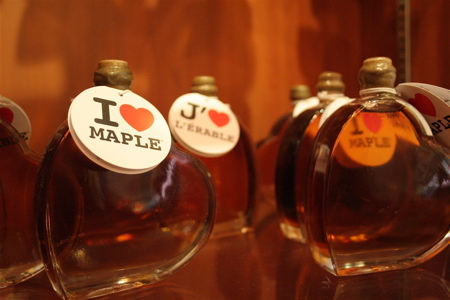 ), Jon and I were able to sample a few of Montreal’s delights and sights. First up, the Montreal bagel. 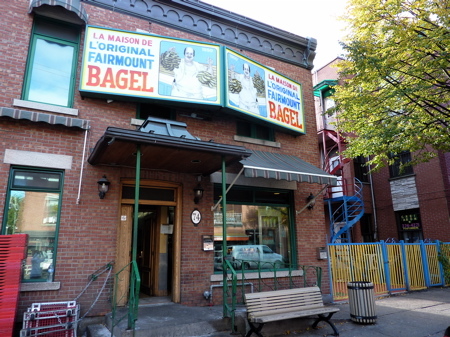 Our friend, born and raised in Montreal, recommended Fairmount Bagel and St-Viateur Bagel. Indifferent between the two, we visited Fairmount and ordered a half-dozen bagels (sesame, onion, and everything) to get us through two breakfasts in Montreal. 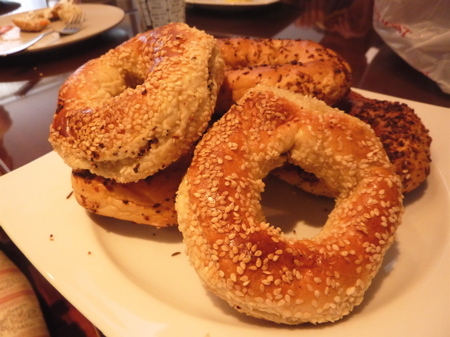 The bagels are sweeter and smaller than their New York cousins, and while I see the appeal of the Montreal bagel, I didn’t think they were chewy enough. Maybe the dough wasn’t boiled enough before baking? Or maybe, just maybe, I’m too biased towards New York bagels to make an objective assessment. Then, for lunch, we had to try poutine. That’s french fries covered in beef gravy and cheese curds, in case you didn’t know. Jon and I were directed to try the poutine at La Banquise, which is open 24 hours a day and is a poutine specialist. The place is huge and the clientele varied (old, young, yuppie, scruffy, tourist, local). We tried the poutine classique and the poutine “Rachel,” a version topped with sauteed onions, peppers and mushrooms. 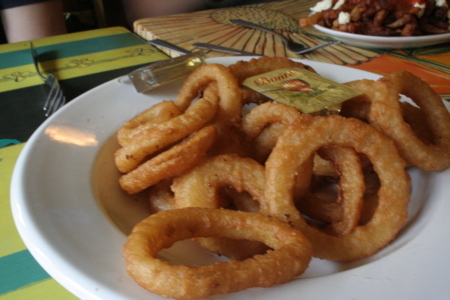 And I couldn’t resist getting onion rings, too, because when your main course is a large plate of French fries, clearly a side of onion rings is called for. Much as I love fries, I didn’t love my poutine. The gravy was bland (i.e., not particularly meaty), and the cheese curds were rubbery, much like fresh mozzarella that doesn’t quite melt when you add it to your hot pasta. Jon called his poutine “a waste of perfectly good fries,” and I must confess I agree based on our one try at La Banquise. 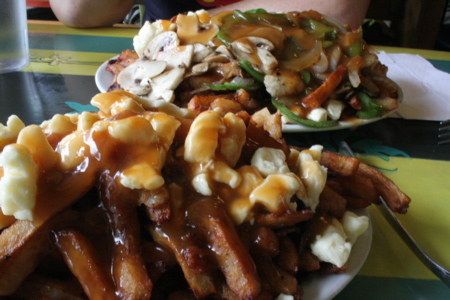 Although I can see how wonderful poutine would be on a cold day when you’ve been out playing ice hockey for nine hours (or after a late night out), I can’t imagine other scenarios in which I’d crave it. Verdict: an acquired taste. Feeling rather weighed down after our poutine extravaganza, Jon and I decided to walk to Mont-Royal park, which is a 20-minute ramble from the resto through the shop-filled Plateau neighborhood. The stretch we walked reminded me of Adams-Morgan in DC — rather studenty-raffish-hippiesh. 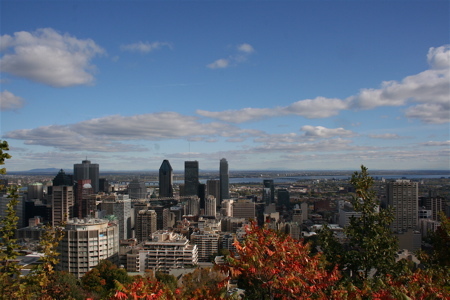 Mont Royal Park was beautiful and full of Montreal’ers enjoying the sunny fall weather. 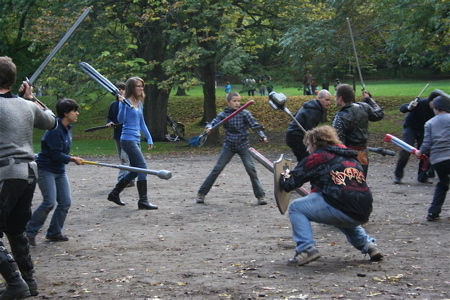 Best people-watching moment: coming upon what appeared to be fantasy armies fighting for victory. The “armies” were comprised of young and old, and Jon and I wondered how these armies/teams are organized. Are they part of some league? Jon and I also spent time exploring old-town (Vieux) Montreal, whose cobblestone streets are indeed picturesque, but the high percentage of shops selling tourist schlock was disappointing. Also, there’s no nice way to say this, but if you’ve spent a lot of time in France, Vieux Montreal will seem really, really small. Like a Hollywood-set version of France. 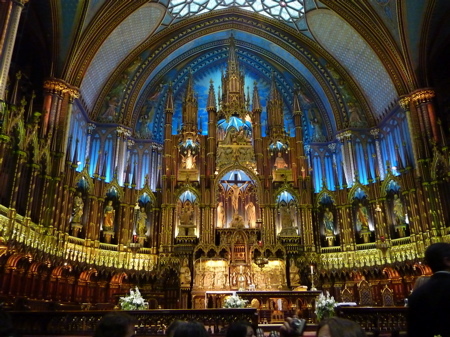 Our friend’s wedding ceremony took place in Basilica Notre Dame, which is also a major tourist attraction in Montreal. So we were happy to play both tourist and wedding guest and ooh and ahh at the basilica’s size and splendor. Having over-indulged at the wedding reception (which took place at one of the old mansions left standing in downtown Montreal), Jon and I sought out the comforts of Chinese noodle soup the next day. 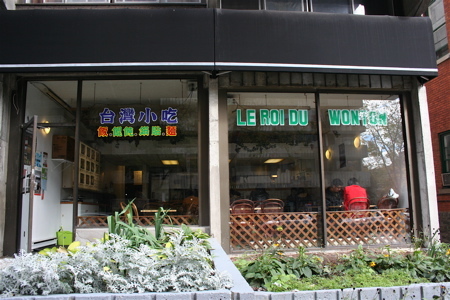 Chowhound pointed us to Le Roi du Wonton, located in Montreal’s “real” Chinatown near Guy-Concordia metro station (which is *not* the pagoda-marked Chinatown that gets touted in guidebooks). 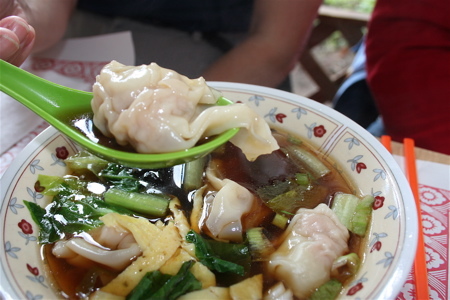 In tribute to both names, Jon and I tried the wonton soup (great broth, good, but not royally good, wontons), as well as the Taiwanese comfort food dishes. 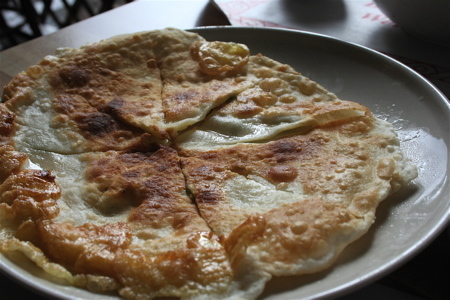 Dan bing (a cross between an egg crepe and a scallion pancake) was satisfying in an oily way, but the fried pork chop was a bit dry and underseasoned. The straight-from-a-bag veg was also a bummer. So overall, I’d stick with the noodle soups and won tons and ignore the “Taiwan” part of the restaurant name. Service was slow but homey and friendly. I don’t recall anything costing more than 8 CAD. Overall, we had a relaxing weekend in Montreal, and I regret not being able to sample its famously laid-back, cool nightlife. We’ll have to pay a visit on our own, when we don’t have a wedding to attend. Using vrbo.com, Jon and I rented a mint-condition 2BR apartment near the Berri-UQAM metro station for 165CAD/night. Renting this apartment was one of the best experiences we’ve ever had with vrbo.com (and I suspect we’ve used vrbo.com almost a dozen times). The owner, Sue, was friendly and extremely helpful. Within Montreal, the metro, taxis and Boris-bike-style programme make getting around super easy and inexpensive. Taxis from Trudeau Airport to downtown Montreal are fixed price at 38 CAD for the 25-minute ride, but I heard good things from other wedding guests about the 747 Express Bus that costs 7 CAD per person each way. Is that cauliflower I can see with the pork chop rice? Shame about the dodgy veg in the Taiwanese joint but good to know there’s a ‘real’ Chinatown and a ‘tourist’ one in Montreal. @Su-Lin – Not sure which way this cuts, but after Montreal, we were in New York for two days and then Florida another three. So we didn’t cross the Atlantic twice over three days, but we sure did spend a lot of time at airports up and down the East coast of N. America. 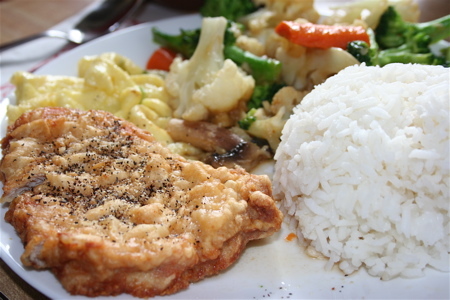 @Mr. Noodles – It most certainly is cauliflower with the pork chop rice. Who orders a fried pork chop??? Also the curd cheese in a poutine is rubbery… clearly you don’t know your food!!! True. Curds are supposed to be rubbery.